The Ebbinghaus Illusion, also known as Titchener circles is an image of two circles with additional circles around them. In this case the orange circle on the left is surrounded by large blue circles and the orange circle on the right is surrounded by small blue circles. 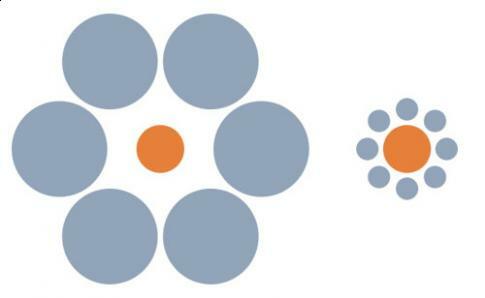 But which is larger, the orange circle on the left or the orange circle on the right ? The answer is of course - they are both the same size. This is a good one. If you measure them they are both 1 inch across...amazing. Do you know the psychological explaination as to why this illusion occurs? awaesome i will win the science fair i believe it and i believe in God!